We’re still curtain-less, living out of boxes, showering with a hose, and cooking on a shattered cooktop. But this quiet street, right here in the middle of this seriously cool city, surrounded by old buildings and cobblestone streets, this is our little slice of heaven. Its original pattern was indiscernible beneath the 100 or so years’ worth of paint that had been slapped on by previous owners and landlords. 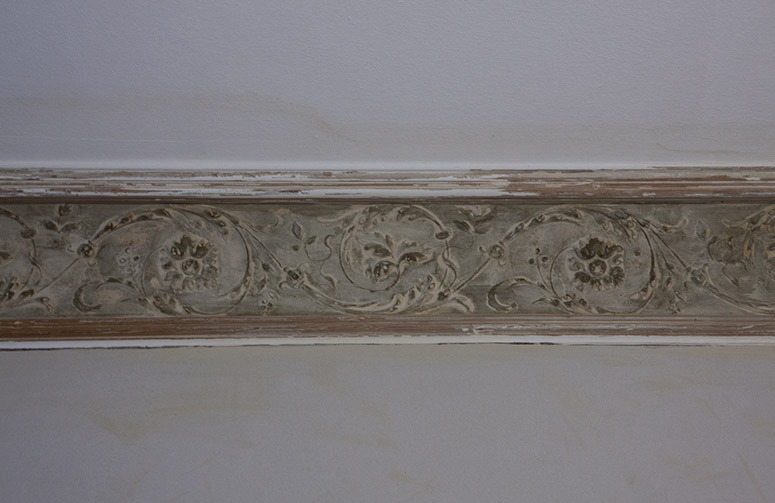 Fortunately, we found a restoration expert named Anne Mette who’s experienced with many aspects of building restoration, particularly restoring old crown molding. Anne Mette has worked on building restoration at Aarhus’s living history museum, Den Gamle By, and she specializes in restoring stately homes. 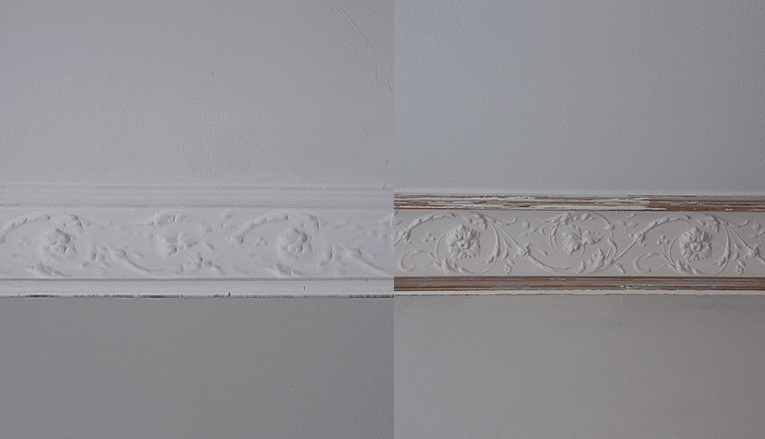 Not that our apartment is even close to being a stately home, but we needed a specialist in restoring old crown molding in order to take it back to the standard it deserves. At first Anne Mette couldn’t figure out what the molding was made of. So, she called a building archeologist at Den Gamle By. Together, they worked out that it’s actually made of papier-mâché. The building archeologist hadn’t known that there was any surviving papier-mâché crown molding in Aarhus, so our project suddenly became very interesting for them. She could remove all of the molding, create a cast of it, and make a replica. She could remove the paint and repair the damaged bits. As a conservationist, she preferred the second option, but it was also the most expensive and she was completely cool with making a replica. In a project of this scale, assuming you have the budget of mortals, you have to be pragmatic about where you spend your money. 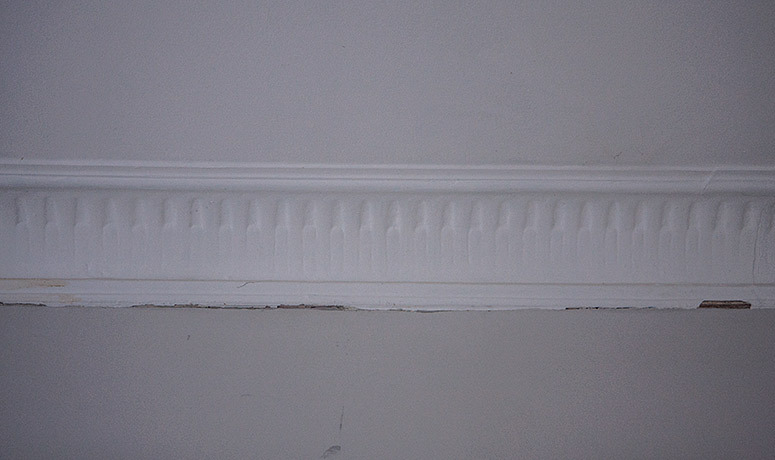 We chose to prioritize restoring old crown molding in both my office and the living room because it’s one of the features we love most about the apartment, and tearing it out, even to replace it with replica crown molding, just felt wrong. 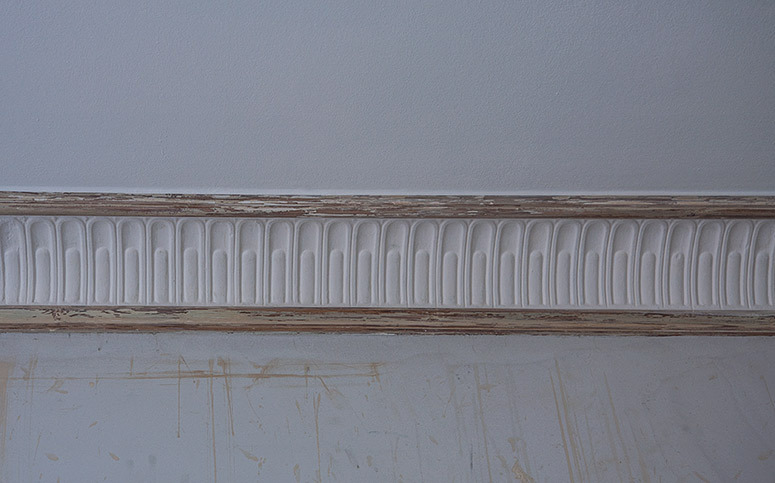 Using a blade, Anne Mette painstakingly removed 5mm worth of paint from the old crown molding in the two rooms to reveal their original patterns and as she called them, “the secrets of the building’s history”. One of these secrets was that the crown molding in my office was originally painted green and gold. Early one morning, she sprayed it with water to give us a glimpse of how it had originally looked. In stripping the rest of the surfaces ourselves, Robert and I discovered that the doors and the woodwork in my office had originally been painted green and gold to match the old crown molding. And at another point in time (probably in the 1920s-30s), they’d been painted black. 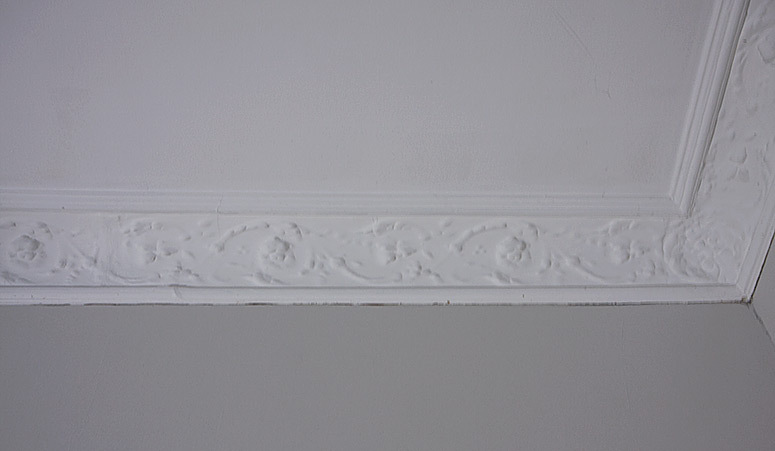 We could always see that the molding in my office had a floral motif, but the pattern of the living room molding perplexed even Anne Mette. 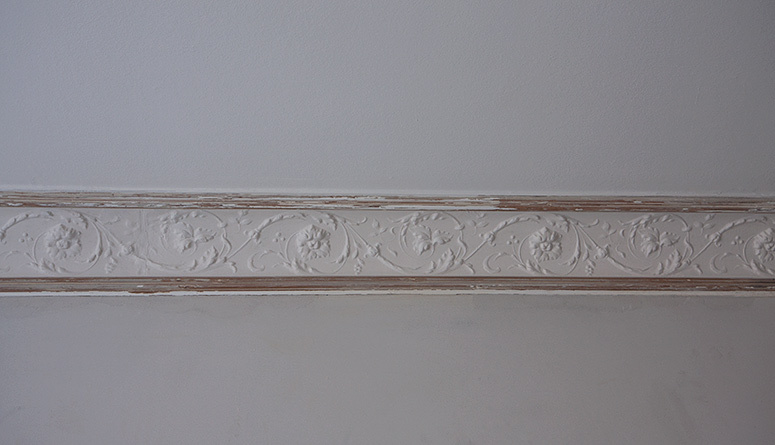 When she finally started stripping the paint, she discovered that the old crown molding in the living room had a classical pattern and that it wasn’t original to the room, but had most likely been added during the 1920s. 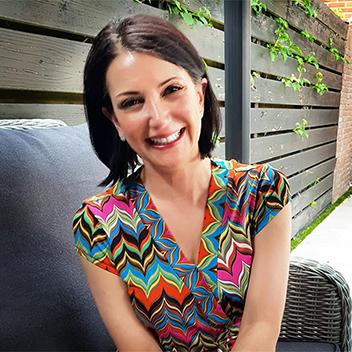 She said that originally around the turn of the twentieth century, guests would’ve been received in my office and wouldn’t have been invited into the rest of family’s home. But in the 1920s, things became more relaxed and she suspects that the crown molding was added then in order make the room more formal and appropriate for receiving guests. 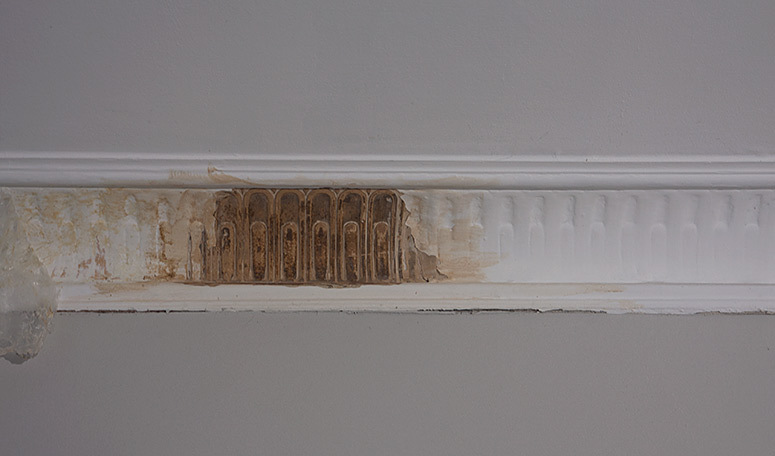 She also discovered that this molding, along with the ceiling, had been painted bright yellow in the late 60s/early 70s. This didn’t shock us since we know that the apartment across the hall used to be a hippie collective. I have pleasant visions of this building being like a Haight-Ashbury Victorian in the 1960s. After Anne Mette had removed all of the paint, she repaired the broken bits using papier-mâché. Then she made her own lime paint in the same way it would’ve been done in 1899, and repainted the molding in both rooms. We’re going to paint the rails ourselves in gloss white in order to draw attention to the molding, which she thought was a fantastic (if not historically accurate) idea. By talking to some of our neighbors, we’ve found out that most of the original crown molding in the building is in the same sorry state as ours was. Worse yet, it’s actually been torn out of some of the apartments during blasphemous renovations! And some of the apartments have lowered ceilings throughout! Once we got into the project, we noticed that the ceilings had been lowered by about a foot in our kitchen, foyer, and hallway. That was a bit of a nasty surprise. But, much stress, mess, and cash later, we have ten and a half foot tall ceilings throughout the entire apartment, which makes the space seem almost palatial (by old European city centre standards, anyway). This place really was a steal… priced to sell because of its condition, one of the few apartments left with most of its original features intact, and one of the best locations in town. But OMG, some days we think this project is going to kill us! While most of our contractors have been a nightmare (you should see the tiling job in the bathroom! ), Anne Mette is a true artisan and I’m so happy our paths crossed. When I’m beyond sick of showering with a hose, eating dinner standing up in the kitchen, and having subfloors instead of actual floors, I look at our gorgeous crown molding and imagine the beautiful things that are to come. Very interesting…I had no idea there was such a thing as a building archeologist. I absolutely love the floral pattern that came alive once the paint was removed. This was such an interesting post…what a treasure to have in your home and office. Neither did I until I met one :) I feel so fortunate to be able to restore and live in such a beautiful property. Despite all of the issues with our contractors, it’s a dream come true! Oh my gosh. I am so jealous of your home. I know it is going to take a lot of sweat and tears but when you are done your house is going to be amazing. I love these details and I wish homes were made liek this still. Thanks, Censie. We think so, too. There’s an award-winning apartment building at the harbor that was within our budget, but the apartments look like soulless boxes. No thanks! Wow, I love old homes and all the projects that come with them. I am such an old soul at heart. I really appreciate the beauty in them that is often over looked. Looks like a great job on the restoring! I can’t imagine ever living in a new build. My house in the States was from 1942 and that was a bit too new for my taste. I adore old homes, but I could do without the projects. I really just want to be settled right now. This looks fantastic! We also have crown molding and my husband is desperate to get rid of it! I think I need to show him this post so he can change his mind. What??? No, no, no… tell him he can’t get rid of it! Seriously, we looked at so many apartments that we would’ve bought if only their souls hadn’t been surgically removed in the name of “modernization”. Wow! It turned out really great, and it’s so nice you were able to keep the piece that drew you to that apartment in the first place. It is absolutely gorgeous, and it immediately gives the space character! I love the idea of getting a good deal and fixing it up specific to your taste! Thanks, Kalee. We’re not actually saving money going this route, but the alternative was to buy a place that someone else had renovated (i.e. ruined). With the limited number of big apartments available, it’s really only former rentals that have most of their original features, or else apartments that just get passed down through the inheritance line. We’re counting on this being our forever home so in the end, it’ll be worth the stress (I hope). OH my goodness, I am in LOVE with the character and can’t believe you found someone that can actually do what they say. Restoring old crown modeling like that has to be a tough job but it looks amazing!! Thanks so much for sharing this with us. Thanks, Heidi. Anne Mette was a bright spot in an otherwise nightmare of a project! I wish we could’ve hired her to do everything. 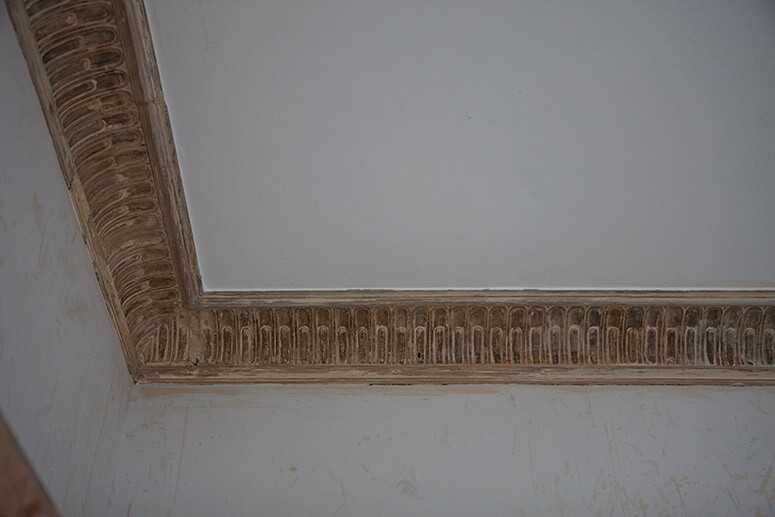 The crown molding restoration is the only part of the project that’s finished, and the deadline we gave all of our contractors (in November) was January 31. This crown molding is fabulous! I love the look of your restoration! Some of those things can be super expensive but the outcome is beautiful! Love it! I’m glad I came across this post. I recently purchase a 1940’s home that has some nice crown molding, but is covered in layers of paint. It looks like a federal molding. I hope I can remove the paint without damaging the molding. 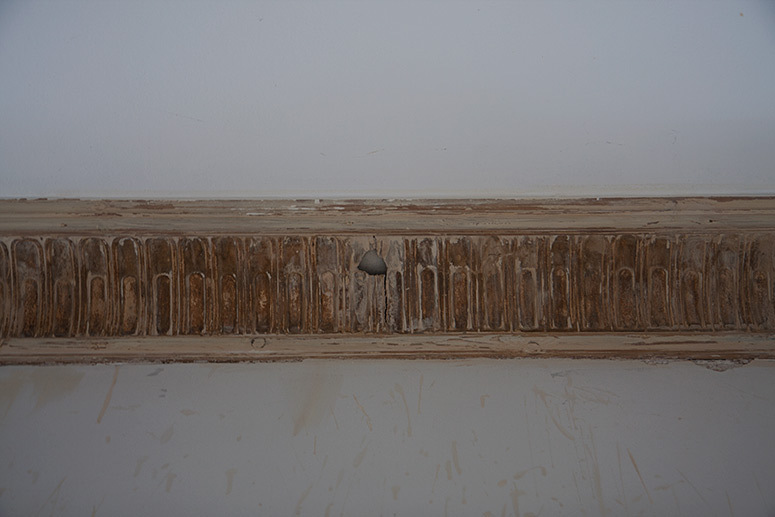 Also, my contractor discarded some of the moldings in some of the rooms(along with some of the wainscoting panels) sigh… I couldn’t believe it. 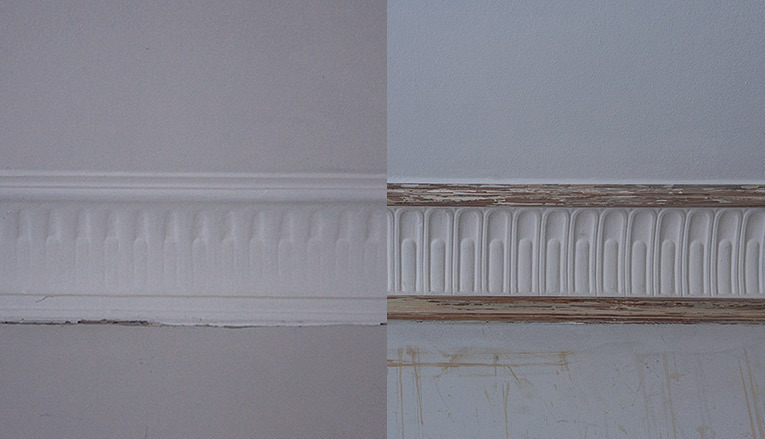 I hope I can save the existing molding and maybe duplicate the other. We’ll see. I was hoping you could share how she restored the molding, I have a bunch that need to be salvaged from almost 100 years of paint. As I wrote in the blog post, she painstakingly removed it using a blade and then used papier-mâché to repair the broken bits. We removed a ton of paint ourselves from baseboards, doors, etc., but the crown molding needed an expert. Good luck! I don’t envy you.